Statistician LOMBORG: TRUMP IS RIGHT TO REJECT PARIS CLIMATE DEAL: IT’S LIKELY TO BE A COSTLY FAILURE – Dr. Bjorn Lomborg: The Paris Treaty will be the most expensive global agreement in world history. It is foolhardy and foolish for world leaders to stay fixated on Paris – not only will it likely falter, but it will be hugely costly and do almost nothing to fix climate change. 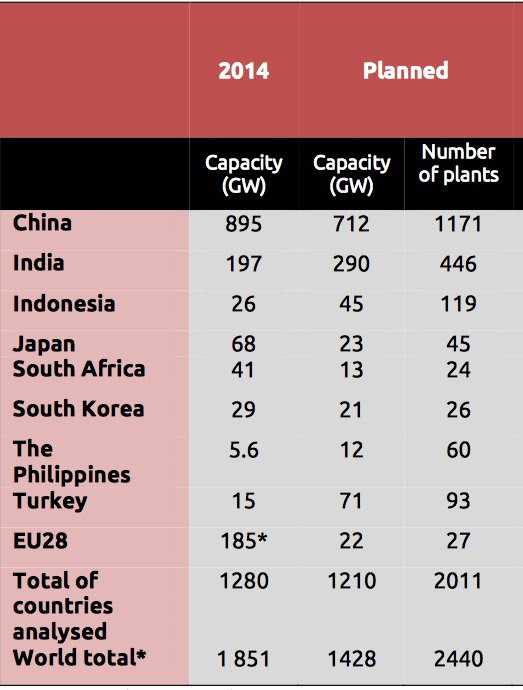 – After hundreds of billions of dollars in annual subsidies, we only get, according to the International Energy Agency, 0.5 per cent of the world’s energy needs from wind, and 0.1 per cent from solar PV. Watch: Morano in Sky News TV debate with Greenpeace: ‘It’s the greatest thing for the U.S. to leave Paris pact’ – Broadcast June 1, 2017 -Sky News -Marc Morano vs. Sky News Anchor Kay Burley and a Kaisa Kosonen, a spokesperson from Greenpeace International. Morano: ‘This treaty has no basis not only in science, but in actual cost benefit analysis. Even if you use all the UN assumptions and believe everything they claim about the science, you would not be able to measure the temperature difference in a 100 years assuming all the countries did what thy planned to do…If we did face a climate apocalypse, you don’t need the UN to sit there and decide what energy mix countries should have. UN bureaucrats don’t have to be in charge. You don’t need central planning to determine that. Sky News Anchor Kay Burley: Trump is really setting himself against almost every other country. is that what we want the leader of the free world to do? Morano: Absolutely. We been called a rogue nation along with Syria and Nicaragua. The U.S was founded as a rogue nation. Trump wants to be a leader. Trump is showing true leadership. Standing up to the world and say we are not buying belief in superstition that a UN agreement that even if you believe in UN assumptions would have no measurable impact on temps in 100 years or has anything to do with saving the planet or climate. Donald Trump should win a medal of scientific courage and political courage for pulling out of this. Listen: BBC radio features Morano in two separate shows: ‘We don’t want to give up our sovereignty so that UN bureaucrats do nothing for the climate’ -Climate Depot’s Morano on two BBC radio programs on Trump’s Clexit from UN Paris Treaty. Full audio from both programs below. Climate Depot Marc Morano adds: In layman’s terms: All of the so-called ‘solutions’ to global warming are purely symbolic when it comes to climate. So, even if we actually faced a climate catastrophe and we had to rely on a UN climate agreement, we would all be doomed! 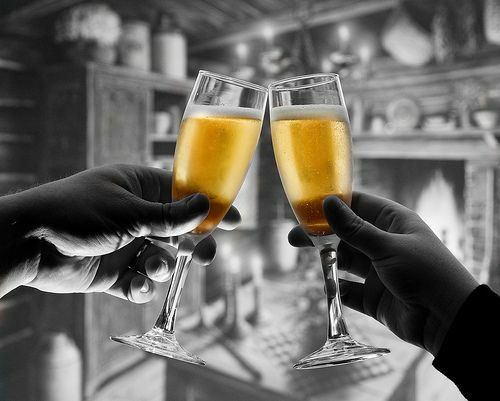 Make no mistake, climate campaigners who tout UN agreements and EPA regulations as a way to control Earth’s temperature and storminess are guilty of belief in superstition. Today, America rejects superstition and the belief that government regulations and UN agreements can control the climate. 1. 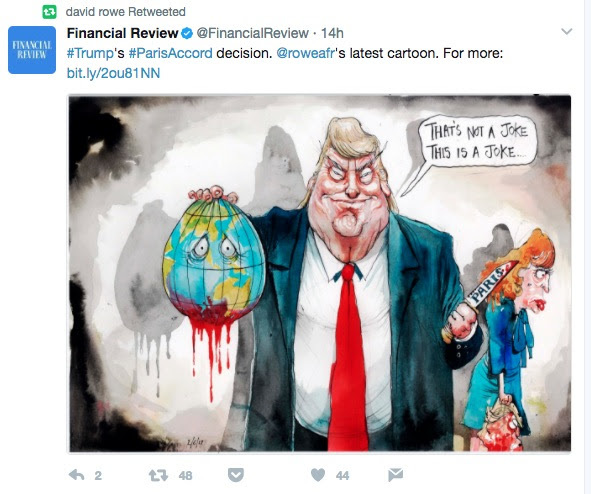 Apparently of the opinion that Kathy Griffin pretending to behead Trump wasn’t quite distasteful enough, an editorial cartoonist for the Australian Financial Review, David Rowe, likened Trump leaving the Paris agreement to … beheading the entire planet. 9. John Kerry, one of the deal’s leading negotiators, said Trump is not helping the “forgotten Americans” he pledged to elevate, but instead will give their kids asthma (perhaps as soon as this summer! ).